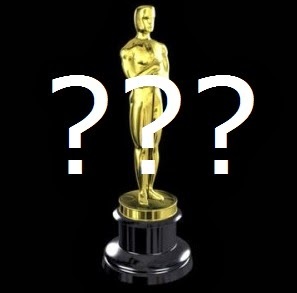 UPDATE: Wow the nominations are out, and like every year, there are some interesting surprises. Like take for instance, Saving Mr. Banks which got ONE nomination (thankfully for Thomas Newman's original score). wow. Lots of fun surprises in the acting categories... both Christian Bale AND Leonardo DiCaprio got nominated leaving the senior members of the group (Tom Hanks and Robert Redford) in the dust. 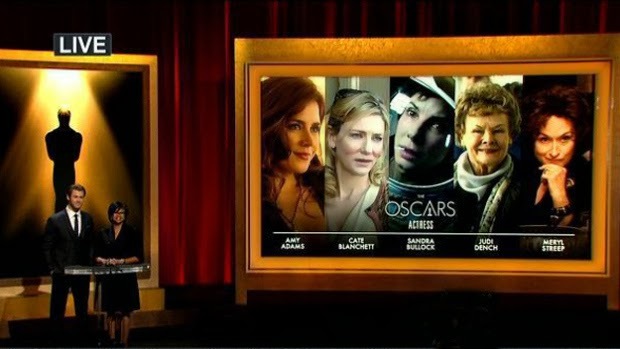 Ms. Streep AND Amy Adams made it in at the expense of Emma Thompson. Oprah snubbed in favor of Sally Hawkins, which is actually a good thing. Daniel Bruhl from Rush snubbed (in fact Rush didn't get anything, not even any technical nods) in favor of Jonah Hill which is a delightful surprise. They really liked Dallas Buyers Club giving it both a surprise (though not shocking) Screenplay nod, an editing nomination, and even Makeup & Hairstyling over presumed favorite American Hustle. (Don't worry Bad Grandpa and The Lone Ranger made it in like I always knew would happen). I'm disappointed Blackfish, one of my favorite documentaries of recent memory was snubbed. That was a tight race. I'm pleased with Her's production design nod, and Prisoners' cinematography nod. Who would have thought the Pixar film Monsters University would get pushed out by The Croods of all films? It's interesting to note that 12 Years a Slave didn't quite get the huge number of nominations most people thought. It's absence in the score, cinematography, and sound categories isn't necessarily shocking, but it may be telling. Gravity and American Hustle lead with 10 nominations. March 2 can't come soon enough! My predictions in red were incorrect. I manged only one category completely correct: Adapted Screenplay. Like the past two years, there could be anywhere between 5 and 10 Best Picture nominees. I’m guessing there will be AT LEAST 9, possibly 10. There are also a handful of other films that could easily take the 9th or 10th slot. I’m talking about Philomena and Blue Jasmine. Heck, I wouldn’t even be entirely shocked to see The Butler show up. If there were only 9 nominees I’d probably take out “Inside Llewyn Davis,” a film that hasn’t had much love from the guilds yet it seems wrong not to predict because it’s a Coen Brothers film. Hey, even A Serious Man ended up making it in a few years back. After last year’s shocking debacle in the Directing category I’m pretty much prepared for anything to happen here. I’m not quite sure about Scorsese and Greengrass. Sometimes the directors branch choose smaller scale, intimate films which makes me wonder whether we’ll see the likes of Spike Jonze or Alexander Payne show up instead. It wouldn’t be a big surprise. If McQueen, Cuaron, or Russell get snubbed I’m pretty sure the apocalypse is right around the corner. I felt like Redford was a lock months ago. But that was months ago. How many Academy members have watched “All is Lost?” And Redford himself refuses to schmooze with the Academy and campaign. That shouldn’t be a requirement to get a nomination, but that’s sometimes how this stuff works. DiCaprio is the most vulnerable and he’s in the most divisive movie here, but it also hit at just the right time. However, DiCaprio has a long (and unfortunate) record of being shamefully snubbed at the Oscars so I’m not all that confident here to be quite frank. Even Christian Bale could show up in a surprise “American Hustle” sweep. Since when did Meryl Streep become the underdog? After having a million nominations I guess. What we have is a six woman race with only five slots to fill, so someone is going to be left out. I was hesitant about Amy Adams. She was left out at SAG but got a BAFTA nod. Streep got the SAG nod but left out of BAFTA. Let’s not forget that just last year Adams got snubbed at SAG for The Master but the Academy came through with a bid for Supporting Actress. It’s officially a fight between the former Doubt and Julie & Julia co-stars. It is possible people might be overestimating Oprah Winfrey here as she doesn’t quite feel like the lock she once was months and months ago. Even the Golden Globes, who love big stars, snubbed Oprah in favor of Blue Jasmine’s Sally Hawkins. But Ms. Hawkins couldn’t even get an Oscar nod for “Happy-Go-Lucky.” Also, I really wonder how much the Actor’s Branch likes “August Osage County?” I don’t feel completely confident in Roberts scoring here. However, if there’s going to be any surprise I’m looking for an out-of-nowhere shock ala last year’s Jacki Weaver. Hence I’ll assume the Academy likes “Dallas Buyers Club” more than we think and possibly give Jennifer Garner some love instead. I don’t see much wiggle room in this category. Sometimes the writers shock with a random nomination, but that usually happens in the Original category. I’m still curious what the surprise nominee could be here. Could it be “Gravity” after all? Most people (even those who love the film) don’t necessarily see the strength in the film’s script which is a shame because the film has a strong emotional core. Sometimes an uplifting indie will make it here which is why “Dallas Buyers Club” has a decent shot in case the Academy feels like snubbing the Coens or Spike Jones. Some might argue that this year wasn’t a particularly strong year for animation. I’m inclined to agree. For once the Pixar film isn’t really the favorite to win and Disney might have a clear shot to take home its very first victory in this category. Yes it’s true, remember this category wasn’t created until Pixar and Dreamworks started dominating feature animation back in 2001, a time when Walt Disney Studios Animation was in a serious creative nosedive. I still don’t think “The Croods” will get in there no matter how hard Dreamworks campaigns but if a movie like “Shark Tale” could get in than anything is possible.